The Little Paris Book Shop is a quiet book, best suited for a frigid afternoon, a cozy recliner, a smoldering fire place and a sentimental soul. The central character, Monsieur Perdu, is an introverted bookseller with a knack for pairing readers and stories. He can read a person better than a trained psychiatrist can untangle a disordered mind. With his insider knowledge, he not only recommends books but refuses to sell them to the readers they will least serve. But despite his insight into others, he remains a mystery to himself, haunted by loneliness. The book is intricate, using unique metaphors, layering characters and unfolding delicately, but for this reader at least, it’s a trifle slow. Though minor conflict is introduced within the first two chapters, it builds so incrementally that the reader risks dropping off to sleep. I write each review from a personal perspective, however. Monsieur Perdu could no doubt have told me this book wouldn’t suit me and found a much better paged companion. This book is perfect for a certain reader–probably a sentimental soul. Having passed in 1963, A.W. Tozer hasn’t been gone long, but he certainly fits the criteria. I love reading Tozer for what I describe as the “pearlistic” quality of his work. He is often defined as a mystic and due to that trait, some of his prose require a few passes to fully understand. But, much like C.S. Lewis, once you’ve mined Tozer’s original intent, you find yourself marveling at the unusual beauty and clarity that he brings to any given concept. The depth of relationship with God that we long for and admire in New Testament apostles like Paul and John, cannot be acquired in the clear, easily navigated, comfortable “daylight” hours. Rather, it is often in the dark, in the wilderness, in the lonely spaces that we are suddenly filled by God. Tozer’s book walks the reader into the painful corners of life, and without minimizing them at all, refines them in order to reveal their necessity. While pain never seems appealing, Tozer paints it in such a light as to reveal its value and the ultimate revival that can come from patient endurance and prayer. Anyone who has ever felt the press of suffering, or the cried out that life seems unjust, or queried how God could possibly work their circumstances for good, must read this book. “Six degrees of separation is the theory that everyone and everything is six or fewer steps away, by way of introduction, from any other person in the world … “ http://www.wikipedia.com. Do your prayers always start with, “Dear God … ” or, “Our Father in heaven … “? “Fixing Our Eyes on God: An A-Z Journey Through The Names of God”, will broaden your understanding of the God who calls you His own, will strengthen your faith showing you how God applies Himself to every aspect of your life and deepen your prayer life. Maybe you see God kind of one dimensionally. I mean, even when we think hard to give our children meaningful names that represent the person or personality we want them to honor or express, we still only give them one name. And for the rest of their lives we call them by that descriptive. Often, they grow to fulfill that name. So have you ever wondered why God introduces Himself throughout Scripture using many names? In her book, “Fixing Our Eyes on God,” Billie Jo Youmans will take you on a simple, daily experience of God as you’ve never known Him before. She identifies names and descriptions of God that perhaps you’ve never heard or thought of before. Can you think of God as your Guide and Guard? What about your Intercessor? She even includes some of God’s names in the original language such as the Omega. I say that Youmans’ devotional book is simple in that you can enjoy its riches even if you don’t have extensive biblical knowledge or hours to devote to Bible study every day. As the title indicates, there are 26 entries, one for each letter of the alphabet. Each includes a short devotion delving into the name of God highlighted that day. Youmans includes scripture, anecdotes and biblical research to explain each name. Then, a page is provided for journaling. This book called to mind an old hymn, “He’s Everything to Me.” One line that has always touched me from that song says, “Then I knew that He was more than just a God who didn’t care, who lives away up there … “. Youmans’ book has done just that for me. I understand now, better than before, more of this wonderful, indescribable God who loves me. Fifty Shades of Grace. Who knew there were so many? How many or much of God’s riches? Did Christ pay for all of it, or was it simply a down payment? “By grace you are saved through faith!” I knew that by heart, but the trouble is, that’s where it stopped. I was saved—now what? Does grace still apply to me or do I now have to earn my keep? As I listened to countless pastors and teachers, attended to dozens of pulpits and persuasions, only rarely did the fog, the confusion over the concept, lift a bit. Instead of feeling adopted into God’s family, I felt a little like a foster child, hoping to please my temporary parent so much that He wanted to keep me forever. I felt worse in church or Bible studies; a cross between motivated to, “go out there and serve God more”, and a fear that I wasn’t doing enough. The old covenant of law-keeping still hung partially across my vision. Saved by grace … saved to serve … and what if I’m not serving God well enough? If you identify with anything I’ve said so far, you must read, 50 Shades of Grace. Who knew there were so many shades of it? Who knew the grace that saved you through the red-hot blood of Christ, is the same grace that beckons the golden sun every morning, the same grace that shelters you in the blue-black storms of life, the same grace that tastes like green grass and looks like being led by streams of living, blue water. It’s the same grace that transfigured Jesus and allowed the disciples to see Him in all of his brilliant white splendor; the same grace continually transforms you from golden glory to golden glory. This book is meant to be read steadily and digested like a scrumptious meal. From the very beginning, author, Dr. Eddie Summers, instructs his readers not to rush through the book. We’re shifting whole paradigms here; this is going to take some time! Fifty Shades of Grace, is effectively broken into 10 chapters, which contain five sub-chapters or “shades” of grace. Beginning with “Grace Every Day”, Dr. Summers walks with his readers through the application of grace in health, troubles, spiritual growth and extending this grace to others. It’s tempting, as a life-long Christian, to throw up our hands indignantly, insert a snippet of Scripture and move on to “deeper” books, believing we’ve mastered this grace thing. Believe me, you haven’t. You never will. Don’t miss this book; or you’ll never know the glorious, full spectrum of grace you’ve been missing all along. If you’re interested in a Bible study on this topic, you can find my book Beyond Belief: Jesus Saved You, Now What? here. Is that the problem–you’re waiting for something on earth when the fulfillment of your longing lies in the realm of eternity? But I’m not going to be that ethereal with this post. I’m talking about waiting on the things you actually need, long for, must see, can only realize here on this earth. I wonder how Abraham felt waiting … and waiting … and waiting … on God to fulfill His promise of making Abraham into a great nation and planting him in the most beautiful, resourceful land. I wonder if Abraham reflected on the fact that God had created the whole earth in seven days and destroyed it with a flood in 40 days. That’s pretty fast, all things considered. So why on earth did God drag out the time He required to fulfill His promises to Abraham. I’ve got a list of things I’m waiting for, a list of things I pray for incessantly and wonder if God has even grown dull to hearing my repetition. You pray, you seek, you ask, you knock. You pray more, ask more, seek more, knock more. You believe God (Genesis 3:6). You die (maybe) (Hebrews 11:13), you see God (1 Corinthians 13:12), not a single promise fails–ever (Joshua 21:45). All things (for all people who love God, in every place, over all time) work together for good (Romans 8:28). You see, it’s “bigger than us” (you’ve got to read Ramos’ book). 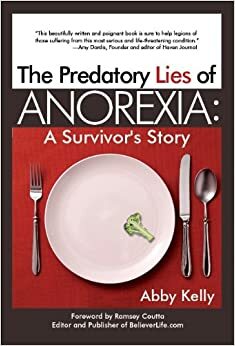 Thankfully, God did heal me from anorexia, and today I walk in progressive freedom. Each day, month, year, I glance back and realize I’m more alive than I used to be. But it’s that progressiveness that means I still need books like Craving Grace, by Ruthie Delk. Delk is transparent from the very beginning. She too was an unbelieving Christian (it’s not really an oxymoron). This Christian’s salvation is not at stake, but their joy–the joy of the Lord, their peace–the peace that passes understanding, and their relationship–the ability to see God as the perfect father–will always be intermittent. Delk uses a diagram she calls the “Gospel 8”. It’s a clever tool that expresses how we hang in the cycle of repentance and restoration for a time, then make a wrong choice concerning our sin and suddenly find ourselves stuck in a cycle of resistance and isolation. These two touching circles of thought and action cause the Christian to either understand their identity as a child of God or falsely believe they are an orphan. With steady steps, Delk leads the reader through specific, practical steps to see their sin as it really is, repent in truth, receive God’s insanely wonderful forgiveness and walk in the light of grace–the grace we all crave. At the same time, one for one, Delk presents what will always happen if we refuse to see our sin as God does, repent in truth and receive grace. Suddenly, we’re back in the circle of orphan-living. John Piper uses the expression, “preach the gospel to yourself.” I’ve never been sure how to do it. The Bible calls us to share the gospel with the world. The majority of nonbelievers find themselves tangled constantly in the lower circle–managing sin and struggling to find hope, peace and joy in morality. So whether I learn to use this tool to preach the gospel to myself or others, there is everything to gain. For each and every Christian, Craving Grace, will be an invaluable tool on their progressive journey toward Christ-likeness. We’ve been walking through Dave Ramos’ book, Climbing With Abraham, and I have to share this little nugget with you this morning! What is God asking you to believe? Is it something that seems completely impossible? Admittedly, I have a few things I’m longing and waiting for that truly seem impossible now–at least highly unlikely.